Your mittens are a wonderful project! Great idea and finish. And yes, I do remember the zig-zag crochet pillows on grandma's and aunts' sofas. Thanks also for the 'cuteness fix'. I loved the mittens DIY and the crocheted CD table runner too. I searched around and found the tutorial link..
Dear Mary Anne......I do not want to be reminded of Christmas and all things gift making, thank you very much. =) Seriously though, gorgeous woollies; what a clever idea. Now, that is a sweet kitty. Why do cats always look so comfy, wherever they sleep. 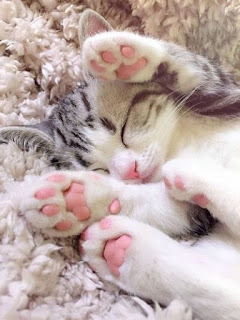 You are so clever all the great things you find to direct us to, love the cute kitten! And your ready prepared Christmas stash of gorgeous hats for next year! That quote is perfect for my week as I have started a new course on the history and culture of Thailand. There is a huge amount of learning, which I am trying to step forward into. I joked last week that I was getting all my Gods in a muddle and the only one I could properly remember was the God of coffee and the course Director has sent out a note saying could we all bring a drink and a snack as there isn't time to go out for coffee!! Ouch - So here I go stepping forward into growth! Looks like you're keeping busy. Lovely mitts. My daughter-in-law wanted the last year from her secret Santa but they didn't come through. I went to Value Village and got a wool sweater and now it sits in my sewing room. I have way to many things on my plate but one day I would like to make these. What a great way to recycle. Love those mittens. I think just about everyone would love to receive them. They look really easy to make too. The CD runner is a brilliant. 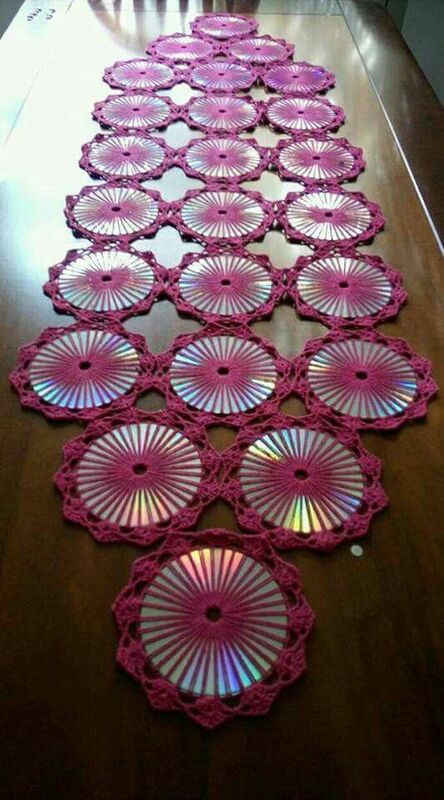 I've seen CD weaving but never crochet. If you Google ...old cds crochet...you'll see some ideas. Maybe you'll find this one. Those mittens are gorgeous and so clever using recycled sweaters and fabric. Truly wonderful. I think I want to try this someday, but I suspect I'll be disappointed to not turn out something so lovely as yours. Thank you, Mary Anne for sharing this project and the link to the instructions. well there won't be any cold hands in Canada next year!! Yoiu have really ran with this...so many pairs. I admire your dedication and organisation. I never think about Christmas until October. Great mittens Mary Anne, and really cosy! Aaah! Love that sweet kitty!